International Women’s Day was celebrated on March 8, with events taking place around the globe. We were heartened to see both the celebration of women and the acknowledgement of issues they face in their everyday lives. But, at the same time, we know that it can’t be just about one day. We wonder how many people know that March is National Women’s History Month. It’s dramatic and easy for the media to report high-profile events on a single day. But to cover events and projects encompassing an entire 31 days? Perhaps not so easy, not so exciting. The roots of National Women’s History Month are in March 8, 1857, when women who worked in New York City factories staged a protest over working conditions. International Women’s Day was next, first celebrated in the United States in 1909, and internationally in 1911. In 1981, the second week in March was designated by the U.S. Congress as National Women’s History Week, and in 1987, it became a month-long observance. Despite its 31-year history, it seems to us that we’ve heard far too little about this month. Fortunately, that’s changing, especially over the last two years. With a new determination on the part of women to no longer stay silent about harassment and discrimination, both IWD and WHM are gaining more recognition. The theme of this year’s Women’s History Month is a perfect illustration that women will not sit down and shut up. 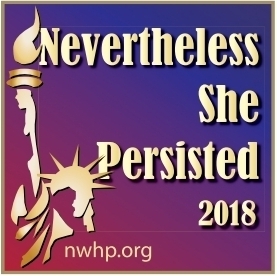 “NEVERTHELESS SHE PERSISTED: Honoring Women Who Fight All Forms of Discrimination Against Women” came out of the February 2017 confirmation hearings for Jeff Sessions as Attorney General. Senator Elizabeth Warren, D-MA, was silenced. At the time, she was reading an opposition letter that had been written by Coretta Scott King in 1986. Senate Majority Leader Mitch McConnell, R-KY, later said “Senator Warren was giving a lengthy speech. She had appeared to violate the rule. She was warned. She was given an explanation. Nevertheless she persisted.” This phrase was immediately adopted to refer to strong women who refuse to be silenced. This theme represents women working together to overcome seemingly insurmountable obstacles and achieving joyful accomplishments. And this year, 15 women have been honored by the National Women’s History Project as its embodiment. These women have helped shape America’s history and are shaping its future through their tireless commitment to ending discrimination against women and girls. Many of these women are not recognizable by name, but their achievements are well-known. We urge you to read their stories and take inspiration from them. And we encourage you to follow their examples and take action. It’s not about one day, one month, one year. Help us in our mission of empowering women.